Woman whose prayers were disrupted by Women of the Wall at the Kotel wonders why police make arrests at Netiv Ha'avot but not at the Kotel. The Rosh Chodesh (new month) prayer which was held Thursday morning at the Western Wall was disrupted by women from the Women of the Wall organization, which violated the directive of Attorney General Avichai Mandelblit that they pray only in the area specially set aside for them by the police. 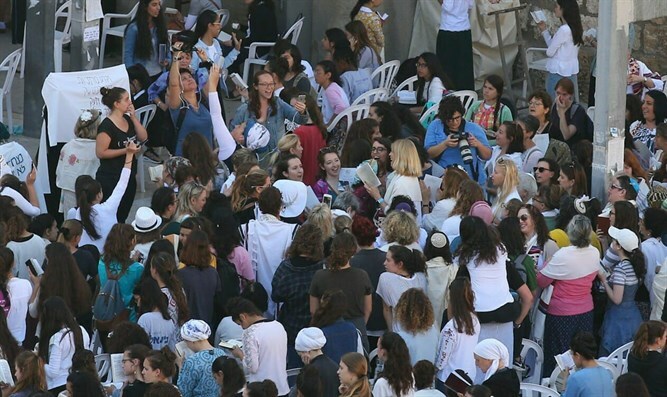 Instead, the Women of the Wall burst into the women's section at the Western Wall and disrupted the prayers of the Orthodox women gathered there and causing a commotion. One of the worshipers spoke with Arutz Sheva, and described the sense of helplessness she felt as her attempts to pray were loudly disrupted. "The Women of the Wall, according to the court's order, had to pray in the place allotted to them and there was a fence that separated us from them," she said. "At seven o'clock while we were praying, the Women of the Wall broke through all the barriers and came to the square where women from the Jewish Quarter were praying at the time," she continued. "It's very unfortunate that this happened on Rosh Chodesh Tammuz, when the destruction of Jerusalem began. I finished my prayer quickly and ran away. This was not for me. "There were girls standing there with yellow vests who were responsible for maintaining order, as well as lots of police officers, and yet no one tried to stop them when they broke through. I ask, where is the determination the security forces showed in Netiv Ha'avot when they detained minors who we all know will face indictments and prolonged detention? Why is it that here there is no enforcement against lawbreakers who violate a court order?" she wondered. "These women have enormous political power and a lot of money. We saw today there are male photographers who documented everything and it was sent around the whole world. The Reform Movement is a rich and powerful movement and it is a game of politics and money. The High Court knows how to act only against the settlers, but when it comes to the Women of the Wall no one says anything."